Software architecture is the discipline concerned with model-based description and analysis of software systems with a view to satisfying the (often contradictory) concerns of stakeholders. 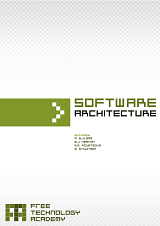 The software architecture of a system is a high-level description of its components and their interactions. The central theme of this course book is balancing the concerns and requirements of stakeholders, combining these into an architecture proposal by employing known tactics and patterns, producing a description of the architecture that can be communicated and analysed, and evaluating the resulting architecture's qualities.